Brian Lamprell trained as an architect in England and has practiced in London, New York, Park City and San Francisco. During my extensive travels across the United States I settled in California and became enchanted with its extraordinary light and beauty. For the last few years I have been drawing in color pencil, buildings in landscape settings, particularly university and wine related subjects. 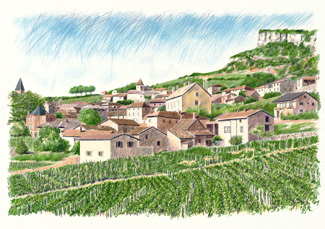 I have recently completed a series of 10 drawings of French Wine Villages and I am currently working on a similar series of California wineries. My drawings are developed from site sketches whenever possible and later completed in my studio. My work has been commissioned for book illustrations, wine labels, packaging and greeting cards. Both originals and prints of my work can be seen in private collections in both the United States and Europe.